It is virtually a global standard that wine is served in a wine glass. Brands like Riedel andZalto have built entire companies producing nothing but wine glasses. Glassware varies from simple and inexpensive to hand blown (which will set you back upwards of $400 for a set of 6 glasses). Yet, at home, wine is often drunk using whatever glass is convenient. So, how important is the glassware when enjoying wine? Here is a brief guide. The basics of drinking any beverage are the same. Much of what we taste is actually what we smell. You can experiment with almost any food or beverage by holding your nose before you smell it, and take a taste. Then, unplug your nose, take a big smell, and taste again. Almost inevitably, they will taste different. The design of the wine glass is simple, and has to do as much with your nose as your tongue. The shape is referred as a “tulip” because of the similarity to the Dutch flower. It captures the aromatics and directs the scent into your nose while you drink. And, because the glass narrows towards the top, it also directs the liquid directly to the tongue for tasting. The combination focuses both smell and taste to accentuate the flavors. Because wine tends to have more complex flavors than, say, your average lager beer, wine generally will taste better from a wine glass. Beyond the basics, the shape of the glass should be slightly different for each style of wine, for different reasons. Red wines use a larger glass. 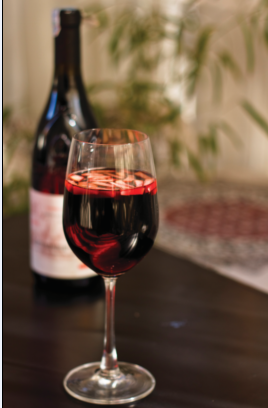 Red wines are typically served at room temperature, and the larger surface area allows the wine to warm faster from cold storage and capture more aromatics. It also leaves more room to swirl the wine, releasing the aromas, without spilling any from the glass.